Stocks are still following the elliptical curve upwards mentioned in our last Investment Analysis Report. In 20 of the last 23 days, the DJIA has closed higher (which has never occurred in the history of the DJIA). According to Bob Prechter “the most similar string of days ended in July 1929.” In his April 2007 Elliot Wave Theorist, Prechter also discusses more recent history: “In 1999, the public was heavily invested in mutual funds, and mutual funds had 96% of their clients’ money invested in stocks.” (Ed. Note: We all know what followed from 2000-2002.) He continues: “Today much of the public has switched to so called hedge funds (a misnomer). Bridgewater estimates that the average hedge fund in January had 250% of its deposits invested. This month the Wall Street Journal reports funds with ratios as high as 13 times.” It’s easy to see how, as the Economist reports, “margin debt is now at its highest level since the 1920’s.” And it’s not just in stocks. 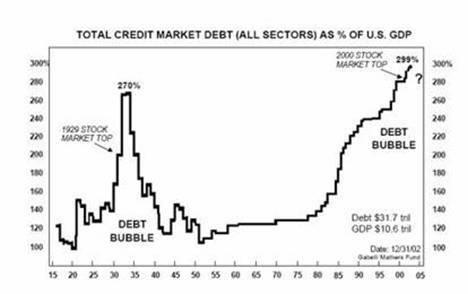 Total credit market debt is over 300% according to the chart below from the Gabelli Mathers Fund. It’s a speculative credit bubble right from the history books. As real estate investors have recently found out when credit disappears so do price gains. Hedge funds will also find that leverage works just as well in reverse. Much like investors who bought stocks at speculative tops in 1929, 1966, and 2000; inflation-adjusted value will not be recovered for at least 20 years. If you appreciate this type of contrarian analysis, our monthly Investment Analysis Report allows for a more in-depth look at markets. Starting in July, it will require a subscription fee of $40 a month. However readers may ‘reserve their seat’ now via FeedBlitz for half price ($20 a month).